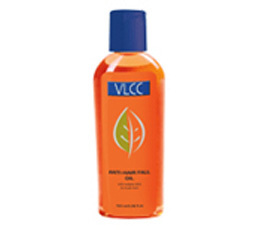 Buy VLCC Anti Hair Fall Oil. Nourishes Roots and prevents Hair Fall. Musk Root Indian Pennywort. This hair oil has the natural strengthening essences of Henna, Indian Gooseberry, Indian Pennywort and Musk Root that together help prevent hair fall, greying and ageing. Use this oil regularly to reduce hair fall. Use a suitable amount of the oil to cover your entire scalp. Massage gently using your fingertips. Preferably apply at night or before washing your hair. Use along with VLCC Shampoo for Damaged and Falling Hair. Indian Gooseberry extract (3%), Jatamansi extract (4%), Hibiscus flower extract (4%), Eclipta Alba extract (2%), Indian Pennywort extract (5%), Himalayan Yew extract (4%), Stone flower extract (2%), Soyabean oil (10%), Wheat Germ oil (5%), Til oil (10%), Mineral oil base (Q.S. ).